As we enter the month of July, a new birthstone – the ruby – appears. Ruby has long been prized for its beauty and texture. In fact, it’s one of the most sought-after members of the corundum species, a family of minerals which also includes the sapphire. As such, ruby attains the highest levels of value in the precious stone marketplace, and currently has the highest per-carat price of any other gemstone on the market today. But, its market price and value are not the only attributes of ruby which make it so special. 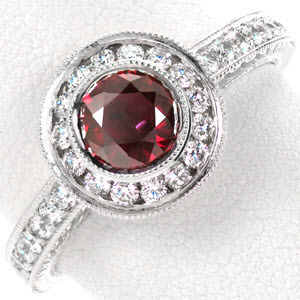 In this special report we’ve compiled exclusively for you at Knox Jewelers, we’re going to take a close look at ruby in all of its splendor, as well as introduce you to the many ways it can be incorporated into a custom created engagement ring for your loved one. Read on to learn more about this spectacular red gemstone! The history of ruby is long and rich, and it has been featured and discussed in the ancient texts of a variety of cultures. The stone derives its name from the Latin term “ruber”, most closely translated into English as “red” – a fitting name given its unique and rich color. 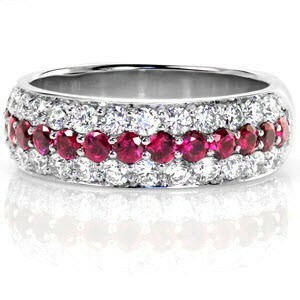 We have found references to ruby gemstones in the bible, ancient Sanskrit texts from India, ancient Rome, and beyond. These stones have long been prized for a host of different reasons, including their toughness, stunning beauty, and symbolic significance, particularly in religious contexts. As the years progressed, ruby maintained its high standing, though the introduction of newer gemstones tempered this enthusiasm ever so slightly. Nevertheless, ruby has continued to maintain its top standing among the different gemstones, and we foresee it maintaining this lofty position for many centuries to come. 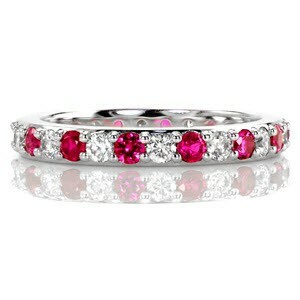 Ruby derives its rich color from trace amounts of chromium found within its crystalline structure. In fact, the presence of chromium is all that separates a ruby sample from a comparable corundum stone. Nevertheless, ruby has had a very high value placed upon it by the market as a whole. 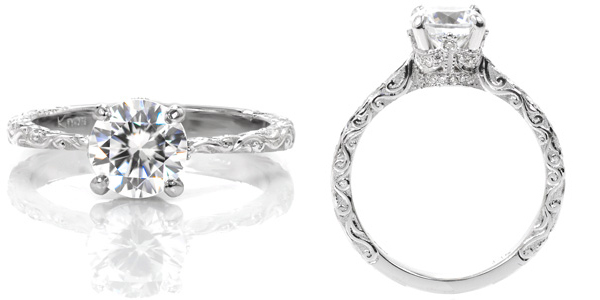 It is still greatly desired by our valued customers, and Knox Jewelers has had numerous orders for ruby engagement rings, pendants, earrings, and more. We truly enjoy working with ruby jewelry as it offers numerous opportunities for creative designs and unique embellishments that truly bring out the rich hues, colors, and textures of the fantastic gemstone. Without further ado, let’s take a closer look at some of the work we’ve done for our clients in the past, and see how we can help you to achieve your desired jewelry today! 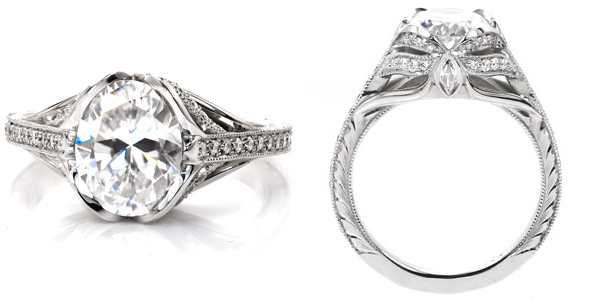 Although we’re happy to create any kind of item you may desire, we specialize in designing hand-made and custom created engagement rings. These rings offer numerous opportunities for creative designs, and incorporating ruby gemstones into them can often add an entirely new level of sophistication and beauty to an already remarkable piece. At Knox Jewelers, we work with all kinds of metals and design methodologies, including the use of recycled gold and platinum, conflict-free diamonds and a variety of other techniques that we’re happy to mix and match for your own special and truly unique design. No wonder, then, that our past clients and their admiring onlookers have equated our jewelry designs with the highest levels of quality – a tradition we intend to carry forward long into the future. 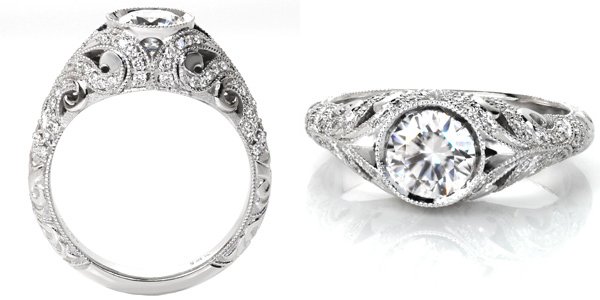 Why not give us a call today, and see how we can help you realize your jewelry dream design? The realization of dreams is our specialty, after all. If you’re looking for a jeweler who truly cares about your wishes and will work together beside you to craft a stunning masterpiece that is guaranteed to stand the test of time, then look no further than Knox Jewelers. Our expertise in ruby jewelry goes way back to our founding many years ago, and we’re always excited to take advantage of this exciting gemstone in order to imbue your heirloom or engagement ring with special significance that is truly bound to make your unique jewelry a one of a kind item. Let’s get started today – contact us to learn more about Knox Jewelers can design a custom ruby engagement ring just for you! There are a lot of reasons why having a March birthday is awesome: Firstly, you’re born right on the cusp of spring and the warm weather (especially for those of us in northern environs). Secondly, your birthstone is the lovely aquamarine, a gemstone which derives its name from the Latin term aqua – meaning water – and marine – meaning of the sea. Water of the sea. Stunning, no? And for those lucky individuals with a March birthday, Knox Jewelers offers an outstanding selection of handmade aquamarine jewelry to celebrate this special month. Now, let’s take a look at the history of aquamarine, how to pick the best possible gemstone for your jewelry, and some examples of custom engagement rings we have designed and crafted for our clients in the past. Even in its natural, unrefined state, aquamarine is one of the most visually awe-inspiring gemstones in the world, and these crystals are widely renown and valued very highly on the market. 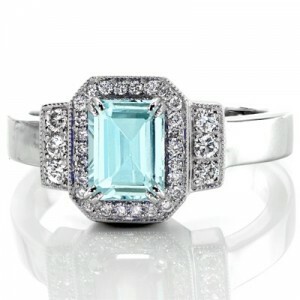 To be specific, aquamarine is a blue-hued variety of beryl, a mineral from which we also derive emeralds. Sometimes, a heat treatment is applied to increase the intensity of blue, though many instances found in the wild are often perfectly suitable as-is for use in jewelry making. The quality of a given aquamarine gemstone depends on a number of individual factors, including color, clarity, cut, and carat weight. Let’s break down each factor one at a time to get a good feel for how these stones are valued in the marketplace. The color range for aquamarine tends to be confined to the spectrum of intense blue to greenish-blue. A general trend in color valuation is that more intense blues tend to be worth more in the open market, though this rule does have its exceptions. For clarity, most specimens have few if any visible inclusions. Stones that have inclusions of this sort tend to be worth less. As for cuts, any and all can be used, though ones that are used for emeralds are also widely used for aquamarine. Finally, larger stones tend to have less demand. In general, aquamarine is a hardy stone. However, it is susceptible to physical damage and heat, so it is very important to ensure that you keep it out of situations which could result in these forms of damage. As for cleaning, it is a relatively simple procedure to keep your aquamarine jewelry in tip-top shape: Simply use warm, soapy water to gently rinse and clean the surface. You should not expose your aquamarine jewelry to harsh chemicals or other invasive cleaning methods, as this could cause serious and irreparable damage. At Knox Jewelers, we’ve been crafting – by hand – stunning and unique aquamarine jewelry and engagement rings for our customers for decades, and we’ve always striven to provide only the best customer service and attention to detail in the industry. 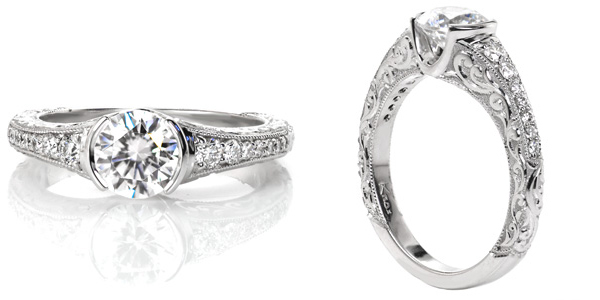 Whether you’re looking for, whether it’s an engagement ring for that special someone or just a surprise for their birthday, you’re bound to find what you’re looking for at Knox Jewelers. 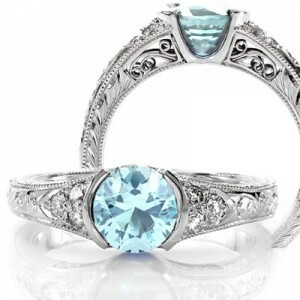 Aquamarine center stones look absolutely great with just about any combination of metal and design. 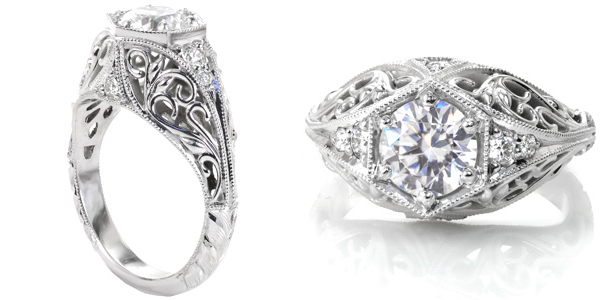 On our website here at Knox Jewelers, you can browse through all of the designs that we have crafted for our customers in the past. Although the samples shown in their preview images will have different gemstones, we would be more than happy to customize your preferred piece with a beautiful aquamarine center stone – all you have to do is ask! As for what combinations work best, we think that white gold and platinum look great for those who are interested in a clean, elegant design. Yellow gold and rose gold can also be used to create a contrast effect that looks modern and sophisticated. Regardless of the direction you’re leaning toward, we have you and your aquamarine needs covered! 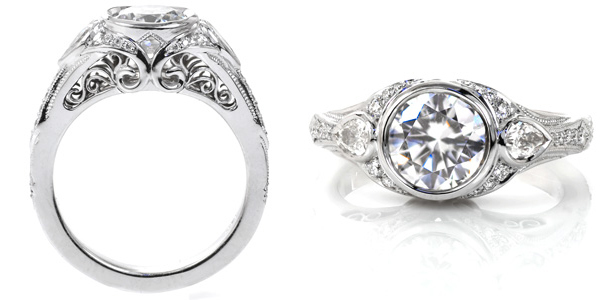 Are you interested in aquamarine engagement rings or other jewelry? Great! We’d love to chat with you about your interests and get a feel for what you’re looking to create. Get in touch with our friendly staff soon, and we’ll get started on making your dreams a reality!